Look no further - Sunset Retreat is your vacation spot! Perfect vacation cabin on premier Hayward-area fishing and swimming lake. Your search for a summer rental is over! This charming, airy cabin is perfect for your family vacation. * Deepest and best fishing lake of the Hayward chain. There is no need for you to look any further; Sunset Retreat is the place for you to make great memories this summer! Please note that the cabin is currently three-season so not yet available for winter rentals. Please check back with us in the future! We've treasured our family vacations in the Hayward area for the past 25 years and decided to share that experience with others by renting. We also own our own cabin on a nearby lake and are committed to the well-being of Sawyer County's natural resources. Level lot with gravel path to the lakefront. Private pier and lift included. A 14 foot aluminum boat with outboard motor is also included in the rental fee. 60 feet of level lakeshore. Shallow, sandy bottom. There is a wood stove in the living room but it is not available for use. Dishes, utensils and small appliances all provided. Eat-in kitchen with large picnic-style table. Large portable stereo unit on entertainment center. Some paperbacks in the entertainment center cabinet. VHS videos of many Disney favorites and some other PG classics. New landscaping and grass lawn. Gravel path to lake. Fire pit by lakeshore. 14 foot aluminum fishing boat with 15 hp motor provided. Additional exterior photos coming soon! We enjoyed a peaceful relaxing 3 days at "Sunset Retreat". The cabin is beautiful, very clean, with comfortable beds and pillows. The kitchen was very nice and easy to work in. We had the disadvantage of very cool and rainy weather, so were disappointed we couldn't get out in the boat or use the fire pit. We did enjoy grilling some steaks though so appreciated having the grill for us. The bedrooms and bathroom had heat which made those rooms comfortable. The main room and kitchen though had only a space heater which didn't heat up the area as well. There were many blankets available though, so we could use them which helped. We absolutely loved the quiet, beautiful surroundings. The trees around the cabin were all changing color and the lake was beautiful as well, even if we didn't get out on it. All in all, our stay gave us the peaceful getaway we had hoped for in a very beautiful place. Peaceful, and relaxing with great views of the lake. Loved the lake and the cabin was perfect for the weekend. Thank you so much for the wonderful weekend - we loved the adorable cabin with every available amenity, the lake was closer than it looked in the pictures, and the screen porch was wonderful for enjoying a morning cup of coffee. Great property and wonderful people to work with! Charming and peaceful retreat on the lake! This is a well-appointed cabin on Whitefish Lake with easy, level access to the lake and a private dock. The cabin’s location on quiet, no-wake Moes Bay insures a relaxing get-away from the bustle. The nesting bald eagles are frequently soaring overhead, the Call of Loons echoes across the tranquil waters, and the night-time stars overhead twinkle with amazing brilliance. Peacefully sit on the bench on the dock or kick-back into the lake-side Adirondack chairs to take this all in. Sitting and dining in the screened-in porch overlooking the lake provides another alternative for taking this all in, too. Whitefish Lake offers a full variety of water sport options and some of the best fishing in Wisconsin. Around the bend from Moes Bay is the sand bar where lake locals gather, swim and wade. For the ultimate in refreshment on a hot summer day, jump into the cool waters near the 105-foot depths of the lake. Fishing in Moes Bay has yielded many outstanding walleyes and trophy muskies. On the lake, water skiing and jet skis are restricted before 10 AM and after 6 PM, to not interfere with prime fishing time or a peaceful, sunset cruise. The Beechmoor Restaurant and Lounge at the other end of the lake offers dock parking, lakeside dining and refreshing beverages. Yes, this is lakeside living at its finest. The nearby town of Stone Lake offers adequate shopping to meet most of your needs. There is also a hidden gem for fine dining in a Northwoods setting, Pine Ridge on Sissabagama Lake. A quick trip to Hayward offers all the amenities and bustle of this popular tourist destination. One will not lack for things to do in the area, but the lake will likely be too compelling to ever want to leave. 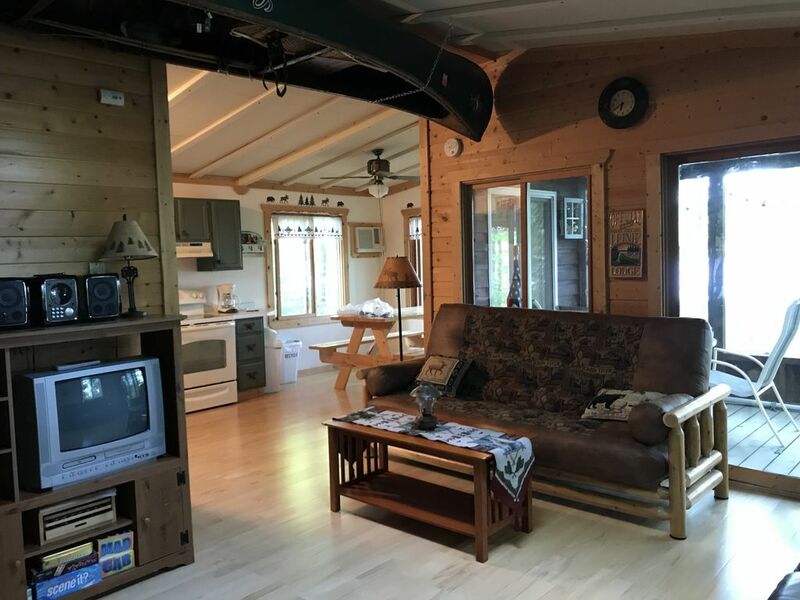 The common spaces (dining room, kitchen and living room) are nicely decorated with Leinie Lodge charm and provide comfortable gathering locations, while providing nice views of the lake. Yes, there really is an authentic Leinie wooden canoe suspended from the beamed ceiling. The bedrooms are cozy and offer comfortable beds and full-size closets. The three individual A/C units allow guests to tailor the inside climate. The kitchen is fully equipped for your cooking needs and the charcoal grill outside offers a wonderful option to grill your fresh catch (remember to bring charcoal to save yourself a trip to the store). Overall, this lakefront cabin is roomy, yet cozy, with a warm family feel. We’re hooked and look forward to returning. Don't miss the fun diversions of Hayward (about 10 miles away). The Muskie Museum is a must-see, along with one of the daily Lumberjack Shows. Miniature golf, go-cart rides, kayak and stand up paddle board rentals, bicycle rentals and horseback riding are also available in town if you want a day away from the relaxing time at the lake. Of course there is the LCO Casino just outside of town for those who enjoy games of chance. As far as other resources in town, Hayward has a terrific grocery store, Walgreen's a 24-hour Wal Mart and a Fleet Farm. The charming downtown has local specialty shops featuring souvenirs, candy, jewelry, clothing and more. Materials at the cabin will provide additional information about recommended restaurants and activities. Non-smoking. Pets with prior approval. Renters need to provide their own bath and beach towels.